CARAVAN was created with the aim of ‘Peacebuilding through the Arts between the creeds and cultures of the East and West’. What prompted its launch and why this specific aim? CARAVAN very much originated ‘out of Egypt’, while I was serving as the rector of the international episcopal church in southern Cairo, from 2003 to 2013. However, personally-speaking, it goes back to my own growing up in Senegal, West Africa, where I was a minority within an Islamic context. I spent the first 18 years of my life there. So, at a young age, my life was all about the building of bridges between those of different cultural, religious and ethnic backgrounds. Also, Senegal is in many ways the artistic capital of West Africa. It’s known widely for its poetry, having had as its first president the poet laureate Léopold Sédar Senghor, visual art and music, a genre called Mbalax. So, I was raised in an artistic and creative environment. Years later, while working in Egypt, these two interests of mine came together. I moved to Cairo just two years after the 9/11 tragedy. 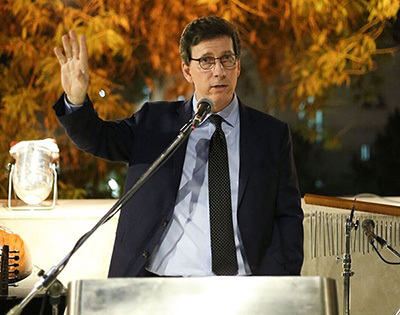 It was a time when there was an increasing chasm of discord and misunderstanding between the creeds and cultures of the Middle East and West. And instead of continuing only with the typical East-West dialogue types of programmes, such as forums, panels, seminars and lectures, we decided to hold an East-West arts festival, based around a visual art exhibition. There were 20 Egyptian and Western artists involved in our first exhibition in 2009 which was titled ‘On a Caravan’, with the idea that we are all journeying together through the arts. And we were completely taken back at the response, with many thousands attending from around the city. Every year after that, we held the CARAVAN Festival of Arts, a city-wide East-West arts festival, involving music, literature and film, around the primary focus, which was a visual art exhibition involving many of the most respected artists in Egypt first, and then eventually from around the Middle East. Individuals such as the late legendary Egyptian actor Omar Sharif and the actor Yousra, were very helpful to us in those early days of CARAVAN. Eventually, our flagship initiative developed into the CARAVAN Exhibition of Art, an annual touring East-West peacebuilding art exhibition that begins in the Middle East and travels to the West, which brings together premier and emerging artists from throughout the Middle East, and sometimes from the West as well, around a chosen theme promoting harmony and greater understanding. Each CARAVAN exhibition serves as a catalyst for the development of a wide range of other artistic events and programmes planned around the exhibition to stimulate discussion, dialogue and education, promoting further understanding. 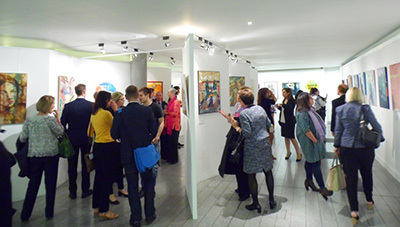 The organisation has held several, varied art exhibitions since 2009. Do you have a personal favourite from the shows held so far and/or one that has brought you particular satisfaction? We hold numerous touring exhibitions of various sizes. 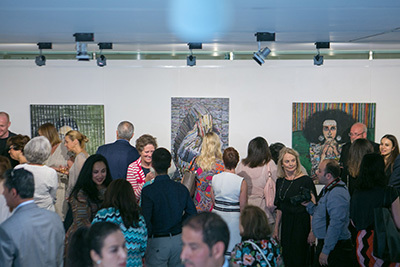 As mentioned, our flagship exhibition each year is the acclaimed CARAVAN Exhibition of Art, which originates in the Middle East and then tours venues in Europe and North America. One of our most memorable exhibitions was held in 2013, a couple of years after the Egyptian Revolution, which led to CARAVAN exhibitions touring outside of the Middle East. Focusing on public art that was increasingly capturing the imaginations of artists in Egypt at that time, the exhibition that year, titled ‘In Peace and with Compassion’, was a public art exhibition of 50 painted life-size fiberglass donkeys that were placed all around Cairo. The donkey is a symbol of peace in both Christianity and Islam; it is also a symbol of compassion in the Middle East, as the poorest of the poor use donkeys. And our message was that the way forward for our world can only be ‘in peace and with compassion’. Following the display of the donkeys around the country, we shipped them to the majestic St Paul’s Cathedral in London and lined them up in a caravan, heading in the direction between Mecca and Jerusalem. 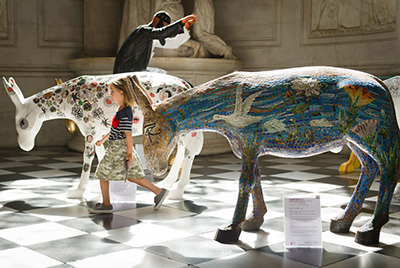 Over 100,000 people came to see the peace art donkeys in just under six weeks. They were then auctioned for a charity in the Middle East by a Sotheby’s auctioneer. Another favorite CARAVAN exhibition of mine, and one that I think is particularly timely, is our current travelling exhibition, titled ‘I AM’. As the world’s attention is focused anew on respecting women’s rights, and while there is an increasing need for developing understanding and encouraging friendship between the peoples of the Middle East and West, the ‘I AM’ exhibition is a visual celebration of the crucial role that Middle Eastern women play as guardians of peace, celebrating their strengths and rich and diverse contributions in the enduring global quest for a more harmonious and peaceful future. Designed to address stereotypes and challenge misconceptions of the ‘other’, ‘I AM’ features 31 acclaimed Middle Eastern women contemporary artists from 12 countries, showcasing their insights and experiences as they confront issues of culture, religion and social reality in a rapidly changing world, both in the Middle East and West. 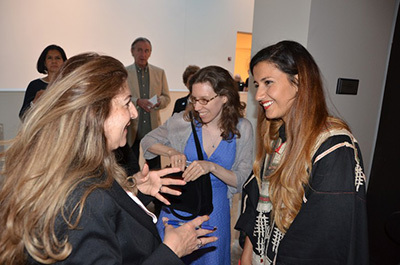 ‘I AM’ premiered its global tour at the National Gallery of Fine Arts, Amman, Jordan in May 2017 under the patronage of Her Majesty Queen Rania Al Abdullah. It was then showcased in London on Trafalgar Square at the historic St Martin-in-the-Fields, and then in the US at the American University Museum in Washington, DC, followed by the cities of Jackson, Wyoming, Cincinnati, Ohio, Seattle, Washington, Nashville, Tennessee, and Burlington, Vermont. The tour will end in December 2018. Are there any contemporary artists whose careers you’ve been especially proud to play a part in launching? What we have enjoyed doing, through our peacebuilding-themed group art exhibitions, is giving emerging artists an opportunity to exhibit with premier artists…an opportunity they would not normally have if it were not for the humanitarian nature of the exhibition. And it is wonderful to see acclaimed artists resonate so deeply with the focus of what we are trying to do, and thereby feeling comfortable to exhibit at times with lesser known artists. What do you think it is about art that gives it the potential to play a part in peacebuilding/building bridges where perhaps politicians or other decision-makers struggle to make progress? Very quickly we began to see how the arts can be a universal language that has the ability to dissolve the differences that divide people when used proactively for that purpose. 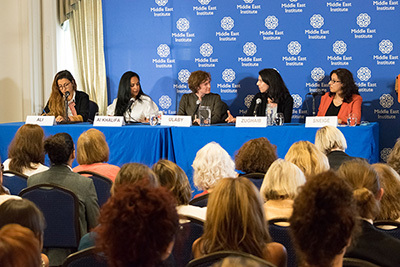 As Kahlil Gibran, the early 20th-century, Lebanese-born poet-artist wrote, “We have forgotten—or have we?—that there is but one universal language and that its voice is art.” During a time of misunderstanding and stereotypes between the Middle East and the West, we have really discovered that arts can be one of the most effective mediums to enhance understanding, bring about respect, enable sharing, as well as developing and deepening friendships between their peoples. For CARAVAN, our overall goal is changing negative perceptions and creating lasting change in the quest for harmony and peace together. For as long as conflict has torn the human family, I believe art has allowed us to see similarity within difference, offering a mode of reconciliation. From our experience, we would say there are three primary reasons. First, there is something ‘transcendent’ about art. Art creates a new pathway of understanding that transcends differences, having the power to strike us on a deep, subconscious level. Kahlil Gibran profoundly realised this when he wrote, “Art is one step from the visibly known toward the unknown.” Art invites us to re-imagine ourselves, our situations, our internal narratives. Art is not a cure, but it is a focal point. Art can offer a pause, a moment of reflection. Art can motivate and inspire. Art can remind us of what makes us most human. Secondly, one of the secrets of using the medium of the arts in peacebuilding, is that art is ‘indirect’ in its approach to addressing very difficult and challenging issues. And as a result, the all too often defensive walls are not raised. As an indirect catalyst, art creates a safe and equalising space in which to begin real dialogue, and sensitively addresses negative stereotypes of the ‘other’, as well as even healing old rifts. The arts can help us put ourselves in the ‘other’s’ shoes. They help us cultivate a profound sensitivity - trying to ‘see with their eyes’. So the aim of art is always higher than art, for it can help us to see someone different than ourselves for whom they really are; that they are like us. In this sense, the arts for CARAVAN aren’t only about encouraging intercultural dialogue, but about something much deeper… facilitating new intercultural friendships - establishing sincere human relationships that cannot be broken by the words or actions of others. 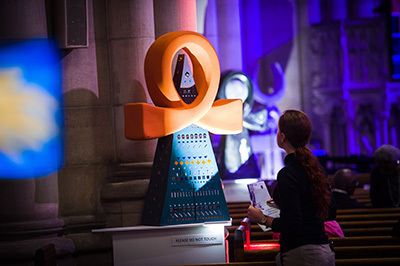 Thirdly, because of the transformative power of art, artistic initiatives become ‘Encounter Points’ that bring people together that would normally never come together, to gain insights into the ‘other’ and alleviate fears that exist. And this is what we see happening in our exhibitions all the time! Do you ever feel that this objective is moving out of reach or too gargantuan, given the scale of conflict and turmoil in the world? On a ‘bad day’ what keeps you going? At the end of the day, I am an optimist, even in the midst of all the current context in our world, especially as it relates to the Middle East and West. We are, of course, all shaped by experiences that we have. And our goal, through the arts, has been to give someone an experience of the ‘other’. Of course, no one changes their perceptions and views on things overnight. However, our focus is to provide an essential step on that journey towards someone eventually not only looking more kindly on those different than themselves, but hopefully coming to the point to be able to fully embrace the ‘other’ in heart, soul and mind. And there are numerous transformational stories that have come about as a result of our work, which has been most encouraging. This is why we focus often on taking our exhibitions of contemporary Middle Eastern art to places that would not normally have an opportunity to experience something like this. An example is the State of Wyoming in the US, which many see as quite conservative and anti-Arab or anti-Middle Eastern. We have taken two of our exhibitions there now, touring throughout the state, and to the credit of Wyoming residents, we have had a tremendously warm reception. I personally love the story that the 19th-century English writer Robert Louis Stevenson shared about an experience he had during his childhood. One evening he was looking out of the window of his house at the man lighting the street lanterns and his mother asked him what he was doing. He responded, “I am watching a man punch holes in the darkness.” This is what I feel we are doing with CARAVAN. I have just returned from Cairo where I was for the opening of an exhibition we have organised and curated, titled ‘Khalil Gibran: A Guide for Our Times’. 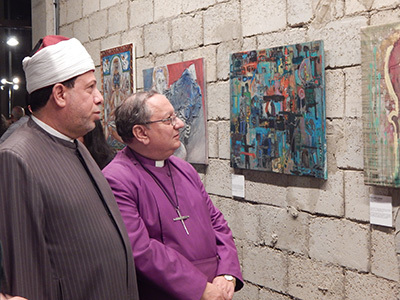 The exhibition is held at the headquarters of Marakez and showcases work by 18 acclaimed contemporary artists in Egypt, inspired by Gibran’s universal message of peace and harmony, found in his art and writings, such as in his best-selling book The Prophet, which celebrates its 95th publishing anniversary this year. The exhibition visually highlights how Khalil Gibran, a supreme East and West figure, can be an unparallelled guide for our times, related to peace, harmony and the building of bridges between the Middle East and West. More than ever, there is a need to hear voices that call us to unity and respect, and to be inspired to live generously in our thinking and actions toward the ‘other’. And Khalil Gibran is just that voice. The exhibition reflects the compelling universal contribution that Khalil Gibran has made and continues to make to the world through his poetry, writings and art, showing how Gibran’s voice is timeless, appealing to heart and mind, faith and reason, a guiding spirit for our times. The Prophet focuses on the themes that unite all peoples and cultures. To read Gibran’s writings is to follow a journey towards peace and harmony, reconnecting us with humanity. 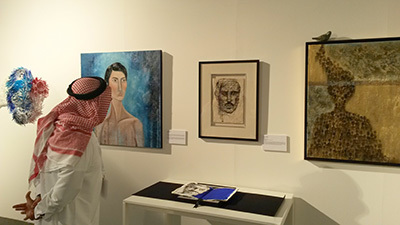 We held a similar exhibition on Gibran this last March in Bahrain at Bahrain’s International Art Fair, ArtBAB, with 18 premier artists there. 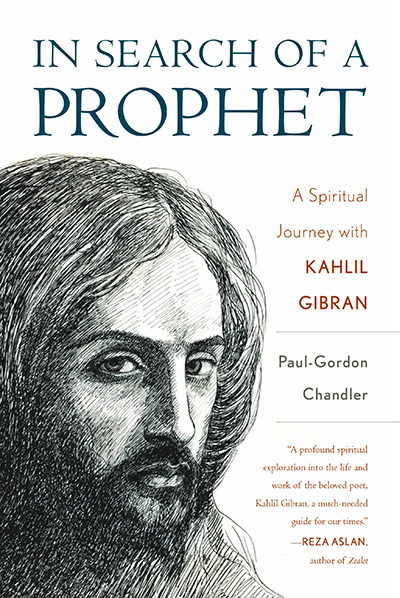 My most recent book, titled IN SEARCH OF A PROPHET: A Spiritual Journey with Kahlil Gibran, which was published a few months ago, is about his all-embracing nature. I am quite passionate about Gibran! What other initiatives do you have planned for 2018 and beyond? We have decided to hold a joint exhibition in London of the artwork from the Kahlil Gibran-inspired exhibitions, plus some new work. It will be titled, ‘Khalil Gibran: A Guide for Our Times’, and the exhibition will be held at Sotheby’s from August 6 to 10. Additionally, we have the ‘I AM’ exhibition tour continuing through the end of 2018. It is currently in Cincinnati, Ohio, USA, and will next go to Seattle, then to Nashville and close in Burlington, Vermont. I should highlight as well that at each exhibition venue, the visual art serves as a catalyst for a variety of events and programmes planned around the exhibition to stimulate discussion, dialogue and education, promoting further understanding related to the theme, and focused on addressing stereotypes of the Middle East and changing misconceptions of the ‘other’ . . . such as artists’ talks, forums, lectures, musical concerts, literary readings, film screenings and panels. We also have some solo exhibitions of Middle Eastern artists coming up this fall in the US, such as in Portland, with the Egyptian artist Marwa Adel. In terms of 2019, we have various projects in the pipeline of course, although we aren’t necessarily ready to publicly announce them. One theme we are looking at in some depth is that of what one might call ‘Ancient Harmony’. We are exploring the artwork of the original indigenous peoples of the Middle East/North Africa and North America, the Bedouin and the Amazigh (Berber) and the Native American peoples. It is fascinating to see how much they have in common and this is profoundly illustrated through their artistic expressions. The goal in such an exhibition would be to illustrate the cultural connections between the indigenous cultures of North America and the Middle East/North Africa region through their art, thereby reaffirming the common threads that form the foundation of modern civilisation. 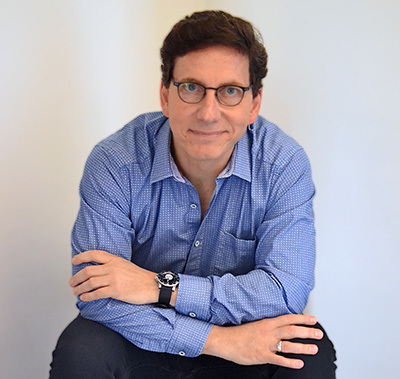 It is a much-needed illustration of the fundamental similarities that humans across the globe share, have always shared and need to build on as we move forward into the future as a tightly connected human family. Are you satisfied with Caravan’s scope or do you hope to see it broaden further? If so, how? We of course always want to continue to grow, learn, expand and enhance what we are doing…not only quantitively but qualitatively. For us, focusing on depth is just as important as breadth. In terms of what we are doing, we have increasingly become more involved in other mediums of art, such a music, poetry, drama and film…albeit around the visual art. And just the other day we began brainstorming about venturing into short films that have a peacebuilding focus…very short films that ‘film-makers’ can produce on their smart phones. So, we are very open to wherever this ‘art caravan of peace’ takes us!